As Envoy Air agents returned to the bargaining table this week, Rep. Jan Schakowsky (D-Ill.) sent a letter along with 31 other Members of Congress to American Airlines CEO Doug Parker calling on the company to pay its employees living wages at American Airlines subsidiaries Envoy Air and Piedmont Airlines. "American Airlines recently announced plans to use $2 billion in company profits to buy back stock through 2020. This is evidence that you have a high level of confidence in your future profitability, and we believe that Envoy and Piedmont passenger service agents deserve to share in that profitability since they are such a key part of American's success," the letter said. In a video update, the Envoy bargaining committee reported that they have made some progress toward a fair contract, but that several key issues remain to be resolved. The next bargaining session is scheduled for July. CWA, representing about 350 workers who are mostly installers, is currently bargaining with Nokia. The company has presented only one proposal in bargaining; it would result in the complete annihilation of one of the oldest bargaining units in CWA. The unit has more than 100 years of history originally as Western Electric, then AT&T Technologies, Lucent Technologies, Alcatel-Lucent, and now Nokia. Nokia's latest scheme is to eliminate its unionized workforce and move to a third-party service provider model that will cause hundreds of U.S. workers to lose their jobs. Future work would be subcontracted and, in some cases, handled abroad. Losing this work would destroy the unit for American workers and retirees. Nokia workers are urging the company not to eliminate American jobs and benefits, and to bargain in good faith with the union for a fair deal that allows Nokia to invest in the U.S., to keep its long-standing installer workforce, and to maintain the quality of service and our telecommunications infrastructure for U.S. customers. The workers are set to take a strike authorization vote by the end of the month. CWA members showed up in full force at the Nokia facility in Murray Hill, N.J., this week to fight for a fair contract. CWA Local 1400 members have reached a tentative agreement with City of Boston Credit Union. The new five-year contract includes wage increases, new options for disability insurance, no increase to health insurance premiums over the next several years, and more. Around 40 reporters, photographers, copy editors, and desk editors at The Florida Times-Union announced this week that they are joining together in a union with the NewsGuild-CWA to give employees a voice in the future of Florida's oldest newspaper. Times-Union employees say they are joining NewsGuild-CWA because the newspaper was recently bought by GateHouse Media, a publicly traded company based in New York, and employees want to have a say in the future of the newspaper by dealing directly with their corporate owner. "We fear that GateHouse's short-term strategies will lead to more and more cuts in the future. 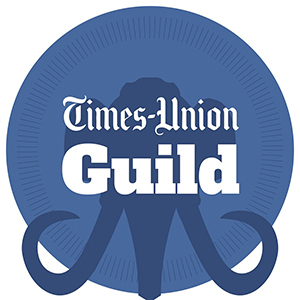 A strong contract will help to protect the work of the men and women who report, edit, photograph, and put together the stories of the newspaper," the Times-Union Guild organizing committee said in a statement. 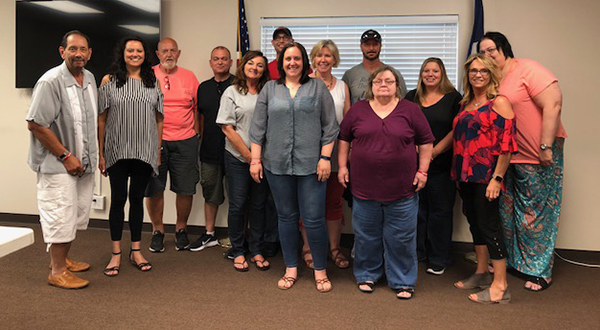 Twelve CWAers from CenturyLink, members of CWA Locals 7101 and 7102, gathered in Des Moines, Iowa, in early June for a two-day combined stewards' training and CWA STRONG organizing training. The group was made up of experienced and new stewards from each local, which gave participants opportunities to collaborate and learn from each other. The CWAers came to the CWA STRONG training willing to learn, with a commitment to do the work necessary to help build our union. Participants learned about CWA Political Action Fund (PAF) and CWA's national legislative efforts to fight back against anti-worker legislation and advance bills at the state and federal level that protect call center jobs. Learning about these CWA efforts helped emphasize the importance of recruiting PAF contributors. The participants began creating organizing committees in each unit, working with lists, setting goals, and creating internal organizing plans to be implemented in the coming weeks. The stewards' training was conducted by CWA District 7 Staff Rep Kay Pence and District 7 Staff Rep Bonnie Winther. The CWA STRONG training was led by District 7 Campaign Lead Enida Shuku with assistance from Pence. The training was supported by the CWA STRONG Strategic Industry Fund (SIF). CWAers from CenturyLink, members of CWA Locals 7101 and 7102, gathered in Des Moines, Iowa, in early June for a two-day combined stewards' training and CWA STRONG organizing training. CWA President Chris Shelton traveled to Liverpool, England, this week to participate in UNI Global Union's World Congress where he joined Lothar Schröder, the leader of German labor union ver.di, in making a strong statement to T-Mobile that it must change its behavior on respecting workers' rights or the unions will not be able to support a potential Sprint/T-Mobile merger. Shelton also highlighted the efforts of T-Mobile US workers to join together to fight for better working conditions, and how ver.di, the union that represents German telecom workers at T-Mobile and its parent company Deutsche Telekom (DT), has built a strong partnership with T-Mobile US workers. While DT respects the freedom of working people in Germany to join together in a union, T-Mobile US has illegally interfered with efforts by workers in the United States to organize. "Now that T-Mobile is deciding that they're going to merge with Sprint, it's time for them to give their employees the right to join a union if they want to," said Shelton. "We want to thank our brothers and sisters from ver.di for all the support they've given us over the years." Shelton also spoke at an event along with call center worker Paola Dirocie of SITRATEL union who works at Teleperformance, an overseas contractor for AT&T, and Ygnacio Hernandez of FEDOTRAZONAS union in the Dominican Republic. As CWA members at AT&T in the U.S. are fighting for good call center jobs through mobilization and bargaining, CWA is supporting Teleperformance workers so that workers in both countries can't be manipulated by AT&T into a false competition that erodes working conditions for everyone. Shelton's letter and phone call to AT&T CEO Randall Stephenson resulted in Teleperformance agreeing to respect its workers' rights to join together. 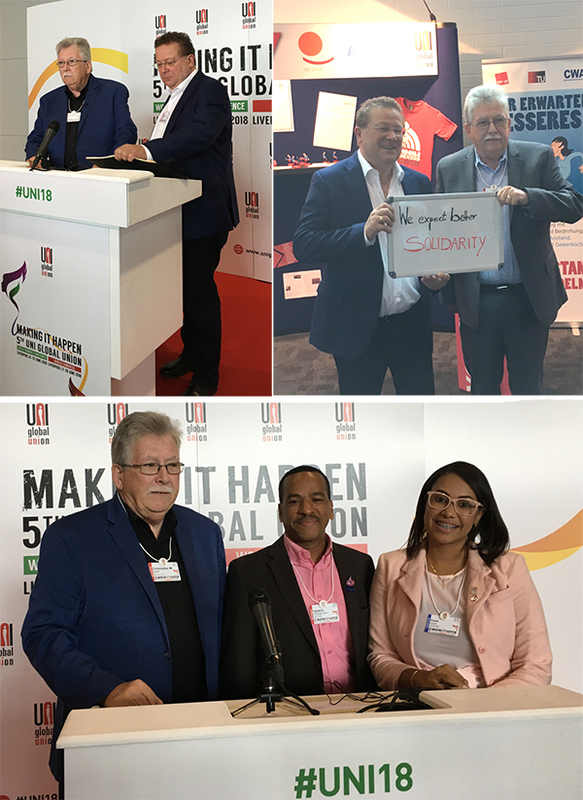 Top Left: CWA President Chris Shelton Shelton joined Lothar Schröder, the leader of German labor union ver.di, in making a strong statement to T-Mobile that it must change its behavior on respecting workers' rights or the unions will have to oppose a potential Sprint/T-Mobile merger. Top Right: Shelton and Schröder at a booth in the UNI convention hall highlighting and detailing CWA and ver.di's joint campaign to help T-Mobile workers join together to fight for better working conditions. Bottom: Shelton spoke at an event along with Teleperformance call center worker Paola Dirocie, gender secretary of SITRATEL, the local union representing Teleperformance workers, and Ygnacio Hernandez, General Secretary of FEDOTRAZONAS, the national federation representing call center workers in the Dominican Republic. As CWAers fight for higher wages and to protect the right to join together to create better workplaces, Democrats in the U.S. Senate and House introduced strong new legislation to help achieve those goals. Last week, Senate Democratic Leader Chuck Schumer (D-N.Y.), House Democratic Leader Nancy Pelosi (D-Calif.), Senate HELP Committee Ranking Member Patty Murray (D-Wash.), and House Education and Workforce Committee Ranking Member Bobby Scott (D-Va.), introduced the Workers' Freedom to Negotiate Act, which would strengthen workers' freedom to join unions and negotiate collectively to win better pay and conditions, stiffen penalties on corporations who violate labor laws, protect workers' right to strike, and protect the integrity of union elections. In a statement, CWA thanked the Democrats for taking action to ensure that working people will have the freedom to join together to negotiate for a fair return on their work, and said this new legislation would make it easier for workers who have joined a union to reach a first contract with their employer and strengthen their right to strike for better wages, benefits, and working conditions. "The Workers' Freedom to Negotiate Act is a step in the right direction toward restoring balance to our system so that it is no longer rigged in favor of corporate CEOs and the one percent," CWA said. Instead of using their massive windfall from the Republican corporate tax cut bill to create jobs and raise workers' wages, corporations have been funneling their profits back into their companies through buybacks, a financial maneuver that was illegal in the U.S. until 1982 in which a company manipulates its stock prices by purchasing its own shares. Rep. Keith Ellison (D-Minn.) last week introduced the Reward Work Act, which would prohibit these harmful stock buybacks that only enrich top executives and large shareholders. Senator Tammy Baldwin (D-Wisc.) has introduced similar legislation in the Senate. Buybacks have exploded in the wake of the tax bill, with companies poised to buy back the largest number of shares in at least 10 years. By buying back their own stock, companies are artificially boosting their stock prices without actually becoming more profitable or hiring more workers. "While buybacks enrich Wall Street and corporate executives, they have harmful effects on workers," said CWA Legislative Director Shane Larson. "For example, AT&T bought back $145 million in stock in the first quarter of 2018, but has rebuffed thousands of workers' demands for better job security in ongoing contract negotiations at AT&T Midwest and Legacy T. Congress should pass the Reward Work Act to help address one of the most harmful aspects of the Republican corporate tax cut bill."